Inspiration sparks. The creative juices are flowing. You're wittling away at your big ideas and inching closer to your version of success. Creative sessions are daily and lengthy, until over time, the space is filled in around them. Your spark fizzles as your time becomes cramped with other responsibilities. Soon enough, your creative sessions squeeze in on themselves before completely disappearing. You still remember those precious moments. Perhaps your yearn for them. But with everything else going on in your life, it seems impossible to make time for something you were once passionate about. If you find yourself in this place, here are some tips for you to begin introducing your creative project(s) back into your life. Side note: I also find this post ironic, because it was in the works when I saw the Abbiee had posted about creating the perfect work week. Please make sure to check out her post after reading this one -- she has some really helpful advice on how you can make time for what you want to get done. It's more technical than what I have to say, so you can use these tips in conjunction with hers! What you do with your time is crucial. Seriously, take a week to track what you spend your time doing. Carry a little notebook with you everywhere you go. Write down the time of your activities, big and small. Then tally it up. You'll be surprised to see what you spend your time doing. If you want to get even more in depth, a majority of smart phones now have a way for you to look at how much you spend your time on them and where you spend that time. Use this information as well. The more you make an effort to look at how you spend your time, the more you will find that there are pockets of it everywhere. Much of it will be spent doing things required of you -- working, attending events you signed up for, chores, etc. You may realize that even more of it is spent recuperating from everything else. That's what I found when I looked at how I spent my time. 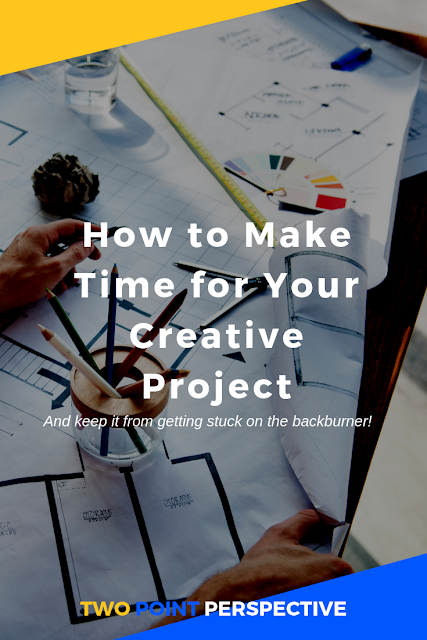 How do I gain control over my time so I can work more on my creative projects (aka the stuff I want to accomplish)? The first solution is calendar blocking. I can't recommend calendar blocking enough. I discovered it through YouTuber Amy Landino, but Abbiee was the one who really explained and broke down how it actually works. She has an incredible playlist of videos called Productivity and Time-Management that I highly recommend you watch. Especially if you're like me and have all these big ideas but don't know how to make the time for them. Life is full of distractions -- be it the natural happenings of life or self-created tasks that help you procrastinate. Whatever it may be, you have to be prepared to combat what gets thrown at you and be willing to move around your schedule. Would you like to know how I managed to publish once a week on my blog last year? I didn't use the entirety of my summer to pre-schedule a million posts during the summer. I didn't even spend a lot of time on my blog each day. I simply set aside 15 minutes dedicated to writing for my blog. Just fifteen minutes! If I felt inspired, this time usually ran longer. If I had a crushing school deadline, I used this as a break to introduce a little fun and relaxation into my day. This technique can work with pretty much anything you can break down. It works with reading -- 10 pages a day. It works with writing -- simply one sentence a day. It works with the Bible -- one scripture a day. It works with big projects that seem daunting -- such as editing a book (one page a day), practicing a piece of music (one measure at a time), and even class presentations (one word at a time). You can apply this break down to the tasks that you can't get yourself to do because they seem too daunting or overwhelming. Instead of a blog post, write the title. Instead of a dozen good photos, focus on one at a time. Instead of shoving a package of chips into your face, pick it up one at a time. You get the point, yes? This also helps you to slow down and enjoy your time, even if stress or anxiety begin to pressure you. Simply remind yourself that it's small -- and remember that, over time, you will see an impact on your work. Did you know that we get to choose how we spend our time? Sometimes all those extra things -- school, work, chores -- seem like they're choices someone else has made for you to do. I encourage you to look at things a different way and write down how these tasks positively impact you. Do they make you grow? Do they push you outside your comfort zone? Do they allow you the financial stability to pursue your creative career that's just getting on its feet? Whatever the case, your life is flexible. Experiment with your time, move things around, and drop what makes you feel overwhelmed. You won't know unless you try new routines, form new habits, and get just a little bit messy.